General Description of CD117 / c-Kit. 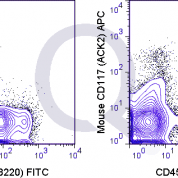 This MAb recognizes a protein of 145kDa, identified as CD117/p145kit. It is found on a wide variety of tumor cells including follicular, papillary carcinoma of thyroid, adenocarcinomas from endometrium, lung, ovary, pancreas,, breast as well as malignant melanoma, endodermal sinus tumor,, small cell carcinoma. However, anti-CD117 has been particularly useful in differentiating gastrointestinal stromal tumors from Kaposis sarcoma, tumors of smooth muscle origin, fibromatosis,, neural tumors of the GI tract. Anti-CD117 is also useful in recognizing myeloblasts in bone marrow biopsy, clot section. Anti-Human CD117 / c-Kit Positive Control Sample: Gastrointestinal Stromal Tumor (GIST) or testicular germ cell tumor. Melanocytes in the basal layer of the epidermis, mast cells in the dermis of normal skin. Anti-KIT antibody staining is expected to be primarily localized to the plasma membrane. There is variability in either the signal strength or the localization of signal in plasma membrane from cell to cell. 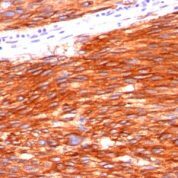 Variations in CD117 / c-Kit antibody staining intensity in immunohistochemistry on tissue sections are present across different anatomical locations. Low, but measureable presence of CD117 / c-Kit could be seen inepidermal cells in the skin. We were unable to detect CD117 / c-Kit in other tissues. Disease states, inflammation, and other physiological changes can have a substantial impact on antibody staining patterns. These measurements were all taken in tissues deemed normal or from patients without known disease. 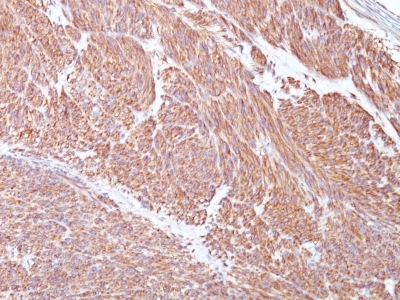 Tissues from cancer patients, for instance, have their own distinct pattern of CD117 / c-Kit expression as measured by anti-CD117 / c-Kit antibody immunohistochemical staining. The average level of expression by tumor is summarized in the table below. The variability row represents patient to patient variability in IHC staining. enQuire Bio's CD117 / c-Kit Anti-Human Monoclonal is available for Research Use Only. This antibody is guaranteed to work for a period of two years when properly stored.